When you are living on one income it means there is a primary breadwinner whose income you completely live off of. Maybe that sounds obvious. What I mean is one income is enough to support your rent/mortgage, all of your bills, groceries, gas and spending money. Living off one income is common in households where one parent chooses to stay home and raise the children and can be a very scary step to take if both parents had previously been working. It might be a scary step, but it is a very doable thing. Trust me, I’ve been doing it for over a decade! Wow, I’m old. Fully depending on my husband to provide has dealt us a fair amount of stress, but it also forced us to make better financial decisions and grow closer in our marriage. At first, we weren’t really great at living on one income. We were very much a part of the 78% of workers who were living paycheck to paycheck while simultaneously incurring more and more debt. 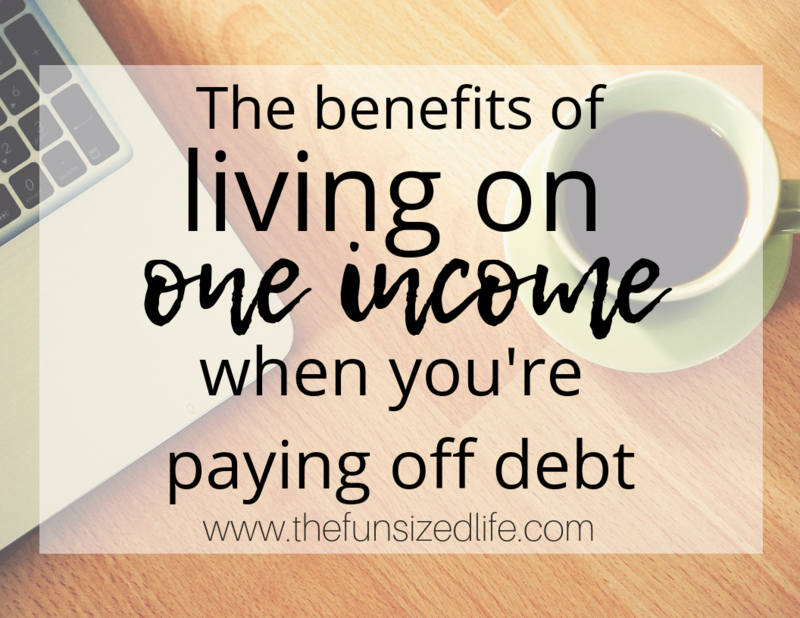 In the last 3 years we have gotten intentional about getting out of debt and staying out of it and surprisingly, living on one income has been highly beneficial during this process. Let me break down for you exactly how it has benefited us. First of all, in order to successfully pay off debt, you need a good debt payoff strategy. For us, this has been Dave Ramsey’s Debt Snowball. Check out all of Dave Ramsey’s Baby Steps here. In just 6 months of paying off our debt with the Debt Snowball, we were able to knock out $6,000 of debt. Considering that we had been previously living paycheck to paycheck, finding an average of $1,000 per month to put toward debt is pretty impressive. After paying off those debts, we took a small break and then started back up this year. Over the last 7 years we have paid off about $90,000 worth of debt and that has been living on one income! So, how did our one income lifestyle benefit us during this time? The Loan Exchange – Starting at 16% APR. Easy to qualify for up to $100,000 in personal loans. Personal Loans – For loans over $4,000 get a 12% APR and qualify for up to $35,000. Dispute your debts: If you are struggling to get out of debt, the first thing you should consider is getting a free credit analysis. You can get some serious guidance and help when it comes to managing your current debts, and find out how much you could be saving on your monthly payments! In order to be a successful stay at home mom, I have had to make sure I have been in constant communication with my husband about our finances. He, in turn, has had to understand how our budget needed to be used toward me and the children. When you know you have a limited income, it can either encourage you to just charge everything and dig deeper into debt, or force you to live a little bit more frugal of a lifestyle. Get a solid budget down and stick to it, create sinking funds in order to help you save for big purchases, find ways to save money on groceries, and all around spend your money intentionally. Living on one income can be a great way to be forced into being more purposeful with your spending. When you are living on a limited budget, sitting down and really thinking through each spending decision is the best strategy. Rather than seeing your one income as a roadblock keeping you from better things, try to see it as a huge benefit that forces you to slow down and make better choices. If one of the main reasons why you live on one income is because one parent is staying home with children, you are potentially saving huge by avoiding daycare costs. The rising cost of daycare is probably the leading drive behind why so many families choose to have one parent at home in the first place. Another benefit to staying home is less gas. This is great for the environment and your pocketbook! Here’s my favorite reason! When you are successfully living on and paying all of your bills with one income, any other money you make is fair game! If you’re not in debt, this means you could build amazing savings (check out the best accounts to open) or plan for fantastic vacations. When you are in debt, it means you have an opportunity to get out of it with less stress as long as you stick to your debt payoff game plan. Check out the exact strategy of the Debt Snowball and take advantage of my FREE printout. I am a big fan of re-working your budget in order to find wasted money. This could be as simple as reducing the cost of your gym membership or cutting cable. If you have no clue where you could possibly find additional money in your budget, I highly recommend taking advantage of the Trim app. Trim looks at your spending habits and instantly finds ways where you could be saving money. As soon as I plugged in my information, Trim found me a discount for my monthly internet bill! When you can’t find a way to reduce your spending or find extra money in your budget, then it might be time to look into additional ways to make money! Start a Blog – Starting a blog takes time and effort but can be a great creative outlet and an amazing income source. Within a year, I was making over twice what I made working part-time outside the home. See my 7 most FAQ about making money blogging. Sell on Amazon – Selling on Amazon is a great option for stay at home parents. One wife was able to help her husband quit his job when she started making over $100,000 per year! Get their free guide to get started! Rover – Get paid to dog sit or walk dogs through Rover! Read my Rover FAQs. Stella & Dot – Stella & Dot is a women’s clothing and accessory company that’s the main drive is to encourage female entrepreneurs to succeed. You can sell easily from home or through hosting parties. Uber – Uber has great flexibility when it comes to hours and you can get paid up to 3 times per day. UberEATS – Deliver food instead of people! See if UberEATS is available in your area. CrateJoy Subscription Boxes – Did you know you can start your own subscription box? Read all about how to start! I have learned first hand just how tempting it can be to start spending when you are bringing in a second income (no matter how small.) Don’t give in to this temptation! Stay focused on your goals and keeping living on one income in order to get your debt paid off as fast as possible. Imagine how freeing it will feel the day that you can claim total financial freedom. Stay focused on that feeling. You’ve got this!